In October 1978, with the leadership and advice of Father Leo Lydon, pastor of St. Joseph Parish in Martinsburg, Bishop Joseph H. Hodges, Bishop of the Diocese of Wheeling-Charleston, purchased the Lewis residence, located near the school in Hedgesville, WV as a future presence for expansion of the Catholic community in Berkeley County. After renovation of the residence, Sister Marlene Rust of the Congregation of Divine Province took up residence in July 1980. Sister Marlene took a census of Catholics in the Hedgesville District and began meetings in her residence. As a result of the census and the initial gatherings, Bishop Hodges felt more property for future development was required. With this came the purchase in 1981 by the Diocese of three contiguous properties on Main Street in Hedgesville. 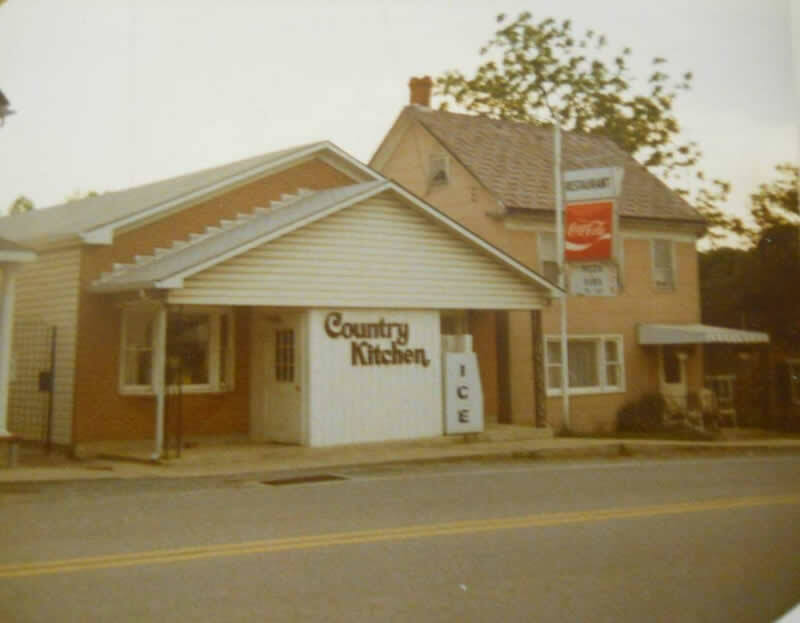 They were (from left to right below) the Country Kitchen Diner, the Albright residence and the Westenhaver-McKee Stonehouse. The Westenhaver-McKee house, which dates to 1852, was renovated and first occupied by Sister Marlene during Lent of 1983. The log house on the Albright property was termite infested and was consequently demolished, as were other buildings, such as a barn. A two-car garage was erected in the fall of 1983. The Country Kitchen, purchased from the Catlett family, was renovated and used as a multi-purpose Center for liturgy, education and socials. The first Sunday liturgy was celebrated by Rev William J Nolte Jr. on the first Sunday of Advent November 29, 1982. At this first Mass, the initial appointed Advisory Council and committee chairpersons weres commissioned. They were Gladys McDaniel, Ray McDonald, Bill Stefanko, Phyllis Porter and Linda Keesecker. At this time the community was comprised of approximately 40 families. Prior to the first Eucharistic celebration, the men and women used their various talents to make the altar, lectern, linens and vestments. Sister obtained the corpse of Jesus for the processional cross from Bishop Hodges. During Lent the reading and study of scripture began on Wednesday evenings. At the request of the parishioners, this continued until the summer months and then returned in the fall 1983 for several years. On the Sunday after Easter, the first infant to be baptized at the Center was Michelle Kisner, daughter of David and Becky Kisner. First Communion was celebrated at the liturgy on May 28, 1983 for Rebecca Hofe and Amanda Brandau. The first election for the Advisory Council was held in May and they replaced the appointed council in June 1983. 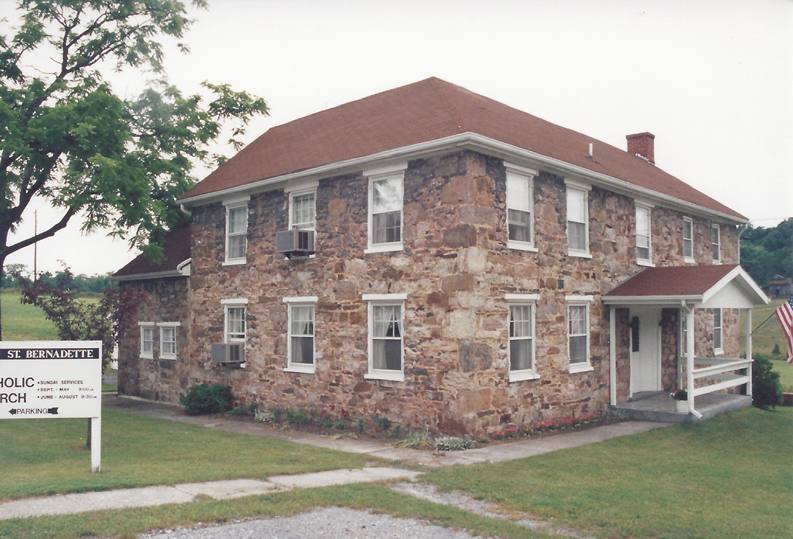 A successful open house with over 250 visitors was held in June 1983 at which the Hedgesville community was invited to tour the renovated historical Stonehouse and the Center. Bishop Hodges made this a special occasion with his presence. Sister Marlene also reached out to the Ministers of the other churches in Hedgesville and this resulted in planning the first annual Ecumenical Thanksgiving Service in 1982 that continues today. Each participating church provides some aspect of the Service and hosts the Service on a rotating basis. This initial gathering led eventually to organizing the Hedgesville Community of Churches for other joint activities outreaching into the community. In September 1983, Mr. Bob Kitchen, husband of Mary Kitchen, became the first catechumen to prepare for reception into the church. On September 10, 1983 four members, Barbara Jackson, Phil Heerd, John Bergling and Cleo Bergling completed training, were commissioned and joined Sister Marlene Rust and Gail Jones as Eucharist Ministers. Parishioners also began their own religious education program for both the children and the adults. A parish dinner was held on February 11, 1984 to celebrate the naming of St. Bernadette Catholic Center. In 1984, St Bernadette began its community outreach through C-CAP, cards to ill, shut-ins and bereaved and Christmas gifts and food to the needy in the district. Mary Frances Smith became the first Parish Liaison with the Office of Social Ministries. The Christian Service Committee began a monthly clothing distribution center. In August 1984, Ed Niner, the oldest parishioner, built an outdoor shrine in honor of Mary. On September 23, 1984 three men were initiated into the Rite of the Catechumenate. Four adults were received into the Church in 1985 at the 5:00 AM Easter Sunrise Service. This was celebrated by a parish breakfast following Mass. The Finance Council held its first meeting on September 9, 1985. On March 2, 1986 Bishop Schulte came to dinner with the pastoral and finance councils. For the first time since its beginning, the community experienced the death of two members in 1987. This began the bereavement process of reaching out to the families who experience a loss. The process continues today through a formalized bereavement committee. A fund raiser was held for the Homeless Shelter in Berkeley County. A liturgy workshop was held during the year. Socially, several parish dinners were held. At Christmas the parish began the Spanish-American custom of Los Posadas, which consisted of visits to parishioner homes with a community gathering of families at the end. In 1986, the Center and the parish house were both connected to the new Hedgesville-Opequon sewer system. Plans were made and approved for the addition of an expansion wing to the Center. The first fund raising drive was begun by the finance council for the $45,000 expansion. In January 1988, the parish began its own catechumenate process. Until then, candidates participated in the process at St. Joseph, Martinsburg. The children also looked forward to the Easter egg hunt after the Sunday service. In 1989, the Social Concerns Committee continued their outreach by inviting a Group Home for severely handicapped adults to a monthly evening of music and refreshments. It was also the beginning of the Lenten Soup Supper each Friday of Lent. This included prayer such as Stations of the Cross followed by a soup and bread dinner. Donations from parishioners of what they would have spent eating regular meals were given to local charities. The first “Day of Reflection” was held on February 26, 1989. On June 9, 1989 Father Nolte began the first evening of “Celebration of Marriage”. This was an evening of Eucharistic celebration with the Renewal of Vows, followed by a reception and dancing. In later years the celebration was moved to Valentine’s Day. 1989 was the year of organizing an active Youth Group at St. Bernadette with Amy and Mike Russell as coordinators. Activities included all-night lock-ins, picnics, bowling, movies, retreats at Priestfield, trips to the Basilica in DC and to the Seton Shrine. The group also hosted a Halloween party for the younger children in 1990. The Eighties was a decade of exciting physical and spiritual growth within the community. St. Bernadette Mission grew from the initial forty families that Sister Marlene gathered to 100 registered families. 1990 was a special year when Bishop Schmitt presided over the sacrament of confirmation for 11 young adults. This was Bishop Schmitt’s first visit to St. Bernadette and the first time that a Bishop presided at a Eucharistic Liturgy. A reception was held following the celebration. St. Bernadette Mission continued to improve it facilities with the installation of a new sound system in 1993 and the paving of the parking lot in 1994. The nineties also included changes in church clergy and religious. In 1992, Father Nolte retired as pastor of St. Joseph and became parish administrator of St. Bernadette. Father John DiBacco became pastor of St. Joseph and St Bernadette. Sister Marlene, after achieving her goals and making an impact on many lives in the Hedgesville area, left to become the administrator of Jeanne d’Arc Residence for women in New York City. In 1994, Father Nolte retired from St. Bernadette Mission and Elaine Guttmann was the first lay person hired to maintain the office. In 1993, the World Youth Day in Denver, Colorado with Pope John Paul II drew a half-million youth and re-ignited a spiritual fire among young people across the USA and Canada. St. Bernadette Mission was proud to have a delegation of youth led by Kathy Reeser at that conference. In 1994, St. Bernadette began its active participation in the annual Hedgesville Heritage Day on the first Saturday of October. Each year an impressive display was developed around a different theme such as Christmas Crèches, quilts, hobbies and crafts and youth art projects. In 1996, St Bernadette sponsored a team in the Berkeley County Youth Basketball League. St. Bernadette participated during the nineties in the Berkeley County United Churches Community dinners and hosted one community potluck for the county at the Hedgesville Middle School pavilion in 1999. Sister Catherine Callaghan was hired in July, 1995 as pastoral associate at St Joseph and St Bernadette with residency in the Stonehouse. Emphasis was renewed on the Youth Group and on small faith communities that followed the Quest program. The St. Bernadette youth group developed an art exchange entitled “Comfort My Children” in collaboration with a nonprofit organization called United Art Bridge. They worked with several other church youth groups to send original artwork and art supplies to multiple orphanages in Croatia. Our group received artwork from the Croatian youth in exchange and held several exhibitions throughout the state. The art exchange became the cover story in the National Catholic Reporter and gained the attention of the United Nations. Sister Catherine and Michael Morrow of St. Bernadette were invited to speak in Geneva, Switzerland at an international youth delegation in the summer of 1996. Sister Catherine, Michael and five other youth from St. Joseph and St. Bernadette returned by invitation to Geneva in the summer of 1998 to present their work at the United Nations Youth Conference on Human Rights. During 1996, St Joseph Parish no longer had an assistant pastor and St Bernadette Mission had to schedule different priests for each Sunday during the next six years. In 1998, after comments from many visiting priests, the parish council began to plan for expansion. Plans for expansion and for purchasing adjoining property were submitted to the Diocese, but did not get approved. While the Eighties experienced physical growth in terms of families, facilities and spirituality, the nineties became a period of growing in spirituality and maintaining the status quo. The community clearly became part of the community as it continued its many activities, its outreach during the holidays and to the needy through its Social Concerns Committee. The Youth Group also experienced increased activities. Growth in the number of families was constrained by lack of space during Eucharistic celebrations. There were 125 registered families at the end of 1999. Sister Catherine left in June 2000 and Sister Patricia Marren joined as pastoral assistant in October 2000. Sister Pat’s emphasis was on the elderly, prayer and counseling. She was also the Director of Religious Education. Visiting priests, primarily Father Bill Linhares, TOR and Fr. Denis Dirscherl, S.J., continued celebrating Sunday Mass at St. Bernadette until October 2002 when Fr. Robert Judge, S.J. joined as Priest-in-Residence. Fr. Judge emphasized prayer and organized Sunday evening Advent services and Lenten prayer. The 20th Anniversary of St Bernadette’s Mission was celebrated on November 24, 2002 with the Eucharistic Liturgy followed by a brunch and program at the Purple Iris in Martinsburg. In the first 20 years, St. Bernadette Mission reached 131 registered families. In addition there were 68 baptisms, 100 first communicants, 7 professions of faith, 11 confirmed in Hedgesville (all others at St Joseph’s), 14 marriages or validations and 19 deaths. Many social events were held including continuation of the Valentine’s dance, an altar servers’ pizza party with Fr. DiBacco, an appreciation dinner held at the Moose Lodge for all ministers and helpers, a night with Fr. Judge, a night with Fr. Ben, Saturday evenings with Fr. Pucciarelli and farewell parties for Sister Catherine, Sister Pat, Fr. Judge and Father DiBacco. In 2005, the ladies in the community began holding annual luncheons at various restaurants. On February 22, 2005, Bishop Michael J. Bransfield was ordained and installed as the Eighth Bishop of the Diocese of Wheeling-Charleston. In June 2006, Fr. John DiBacco was reassigned to St. Mary in Star City, WV and Msgr. Patrick Fryer, a retired Marine chaplain, became the new pastor. Fr. Judge left St. Bernadette in late 2006, but Msgr. Fryer was able to enlist the assistance of Fr. Michael Cavanaugh, Msgr. Ansgar Laczko and Fr. George Pucciarelli. He also named Mr. Frank Dobscha as Acolyte. Shortly after his arrival, Msgr. Fryer declared “New Beginnings”. He determined the Center was to be used as a sacred space and not for multi-purpose use. He also agreed that St. Bernadette was in need of a new church. Initial plans were made for a gathering space that would eventually become the entrance to the new church. After much discussion with a building committee, the parish council and the Diocese, the Bishop approved the plans for the new church. The gathering space was completed in 2008 and construction on the new church began in 2011. Fr. Pucciarelli was instrumental at St. Bernadette in obtaining several large donations of money and sacred materials for the new church to be built and dedicated in December 2012. A fundraising campaign was begun in 2009 and the parishioners took great pride in the facilities as well as raising funds for the cost. When Bishop Bransfield visited the new church for the dedication, he spoke approvingly of the beautiful facilities. When he heard of the increase in numbers of children attending religious education, he encouraged the community to build a new facility for them. Bishop Bransfield began the drive with a large donation from the Diocese and in 2015 the Bishop Bransfield Religious Education Building was dedicated. It is truly “new beginnings” for St Bernadette’s Mission as we look forward to the future. With the new church facility and education building the community is experiencing new growth in family numbers to over 250. Activities include many children with returning numbers to religious education. The community continues its outreach through the social concerns and bereavement committees and there has been a return of social events in the former Center which has been named McFadden Hall, in honor of the largest bequest to start the building program. Once again with a priest-in-residence, parishioners have someone special in their presence for counsel, weekday Mass and special liturgical events such as the Triduum and a church large enough for weddings, funerals and all sacraments within a truly sacred space. And since 2017 St Bernadette has a new permanent deacon assigned, Rev. Mr. Marcus Pressel to assist in our spiritual development. 1982 – 1992 Rev. Wm. J. Nolte, Jr.
1992 – 2006 Rev. John V. DiBacco, Jr.
Abbott John Logan, O. Praem.